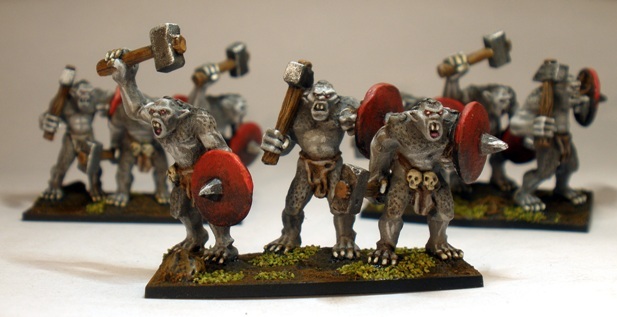 The next addition to my growing 10mm horde is these Copplestone War Trolls. These are very nicely sculpted figures that were pleasant to paint and I recommend them without any serious hesitation. I do have a couple of minor gripes though. The sculpts have nice faces that have a characteristic Copplestone style to them. The detail on the models is crisp although the designer has kept the figures quite clean: there are not many extraneous details. Normally I like a minimalist miniature design approach as it speeds painting along. Extra detail does not always equal more character (Games Workshop please take note). In the case of these trolls however, I think that it was a minor error. Because these figures are quite large (as 10mm trolls go at least) and because there are few details on the figures that demonstrate scale other than the occasional skull on their belt (which could be a skull from a fantasy creature of any size really), it is easy to mistake these guys for 25mm or short 28mm figures. The shields are the main culprits here: the shield looks plain enough to be a 60cm diameter Roman parma rather than the two metre diameter, livestock/vehicle/you-and-your-family flattening piece of ordnance that a creature of that size would likely carry. Also the fact that the plain shields and weapons look somewhat factory produced is somehow incongruous with the primitive looking trolls. I know that Mordor and the like seem to have quite efficient production facilities (no union presence is a factor Id say) but the pairing of those weapons and those trolls doesnt sit quite right with me. Painting was straightforward. I considered painting them a shade of green but the scaly shoulders, knees and arse were obviously designed under influence from the troll design in the Lord of the Rings movies, so I went with an approximation of that. I enjoy painting pale flesh tones anyway. 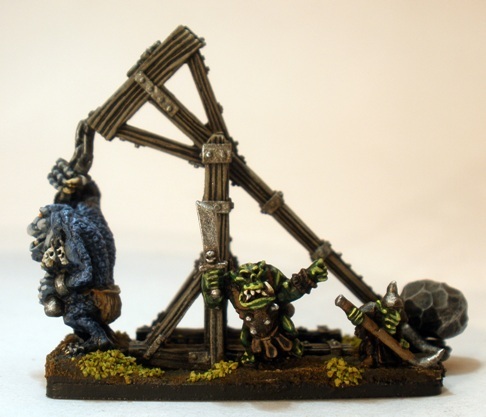 In Warmaster troll sized creatures tend to be mounted three to a base. As these figures are being prepped primarily for that game that was the plan. Unlike when painting 28mm figures, I paint miniatures at this scale separately from their bases and attach them afterwards, so that I can get at the awkward areas while painting. Thats what I did with these guys too. Trying to get three big guys like these to stand together on the same base was awkward. Awkward enough in fact for me to swear passionately when I manged to knock all nine trolls onto the wooden floor while trying to perch them delicately on their bases without cover each other with glue. Once the tears had dried sufficiently for me to cover up the damaged paintwork as well as I could I finally got them stuck down and based. 20:20 hindsight tells me that I should have simply mounted the figures two to a base and added either scenic pieces or the occasional goblin or orc to add scale, but its too late to do that now. Despite all of my whining I still like these guys quite a bit. 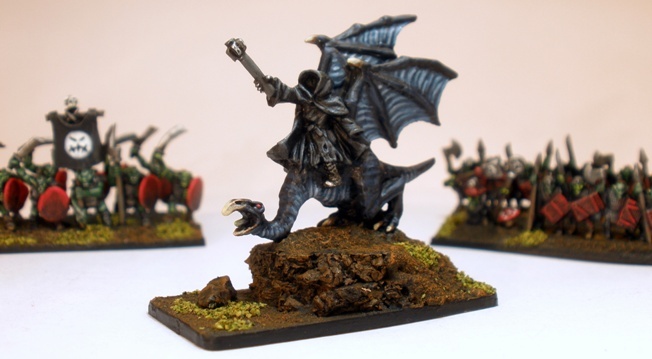 Their particularly massive stature makes them look rather threatening alongside the front of my second goblin unit. 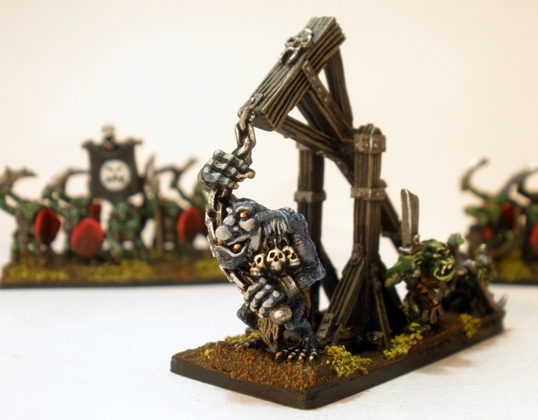 This is a quick post to show my second unit of 10mm Goblins. 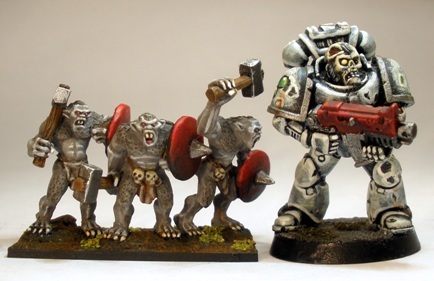 They were painted at the same time as the first unit, so everything that I said about them applies to these guys too. My first finished 10mm unit. 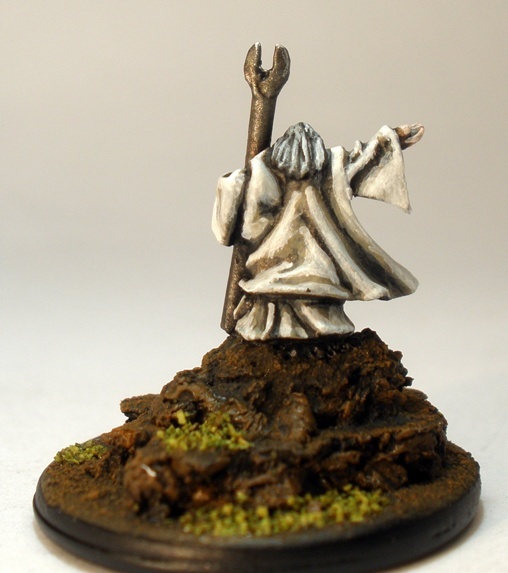 As mentioned earlier this week one of my bi-decade forays into fantasy miniatures has begun. 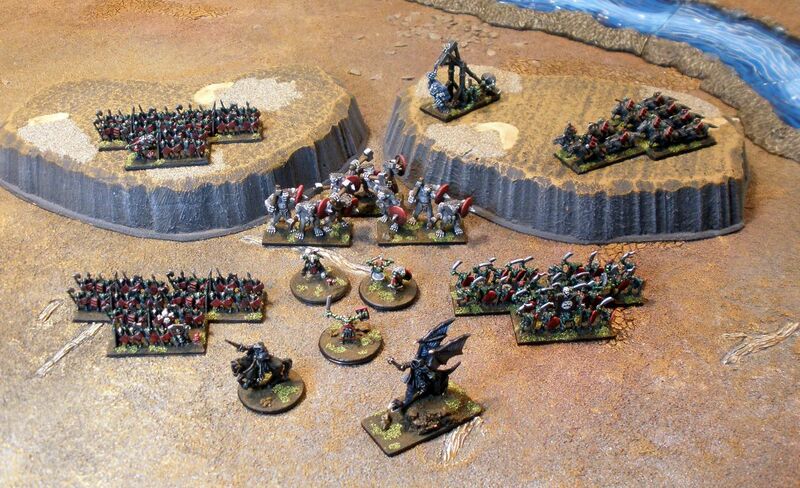 This time its 10mm orcs and goblins based as regiments rather than individually, hopefully for use in a variety of games. This unit of little guys plus their shaman chaperone are the first off the conveyor. Apart from the leader models in the regiments the figures are from the GW Battle of Five Armies boxed set. The majority of the models in that box are slightly smaller than their GW Warmaster equivalents, but not so much that it bothers me, doubly so in the case of goblins. As long as the little guys are smaller than the orcs that they hang out with and the humans that they want to eat, then I dont really mind what size they are as long as they look reasonably malignant. An obliging Chaos Space Marine models the Summer 2012 Goblin Collection. Each BoFA troop type is represented by two strips of plastic infantry or cavalry. Unfortunately only one strip is supplied for each troop type which results in a cookie cutter look when they rank up. This is little bit of a pity. If there were even two strips for each unit then enough variation could easily be incorporated into units to draw the eye away from the cloned look. On the other hand, if the goblins are anything to go by then the figures in the BoFA box paint up very satisfyingly. The sculpts are clean and less comical than the Warmaster goblins, if that sort of thing appeals (I would be happy with either really). To give a little more identity to the units I cut the plastic troop strip down and added a Warmaster Night Goblin and accessory (a squig) to the front rank of the front base of the three base strong unit. These additions dont mean anything specific in rules terms, but make the units a little more recognisable and more interesting to paint. I imagine that scale purists might feel that the Warmaster gobbos look a little stylistically inconsistent with their weaker underlings. This bothers me not one iota. I made up the colour scheme for these figures on the fly. I knew that they had to be dark but not so dark as to be indistinct. 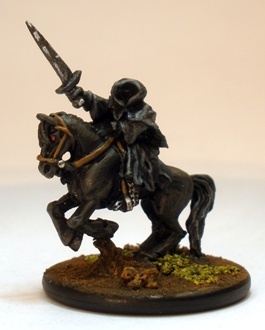 I enjoy the Lord of the Rings movies (I watched them for inspiration while painting these miniatures) but I feel that the evil forces on those films are just a little too hard to see due to the very restrained palette used. The most obviously noticeable variation from goblin to goblin is usually their skin tone which varies from grey to green to red to black. The photo above illustrates what I mean adequately enough: even in daylight the goblins are almost monochrome. A decision to make the evil LotR movie forces look murky and to ensure that everything from their flesh to their garments to their armour and weapons were similar tones must have been made somewhere during production of the movies. I suspect that the urge to make sure that the bad guys looked menacing rather than comical (which would have upset the tone of the series badly) was the driving factor. The colour scheme for my bunch of 10mm bad guys had different goals. I decided to go for a more traditional toy soldier-y, distinct-on-the-tabletop look for these guys. Quite bright green skin tones and red focal points work to lift the black/grey/brown outfits. Highlights were applied quite harshly as they simply dont show otherwise. I may not have made the highlights bright enough to show up on a table three feet away anyway, but it pleases me to add that level of detail all the same. So while my goblins are wearing mainly black outfits with mid-to-dark metallic areas they also feature a fair bit of red, mainly on shields. Its a little bit cartoony perhaps, but it makes the tiny little guys more interesting to look at en masse. With just black and green they looked uninspiring. 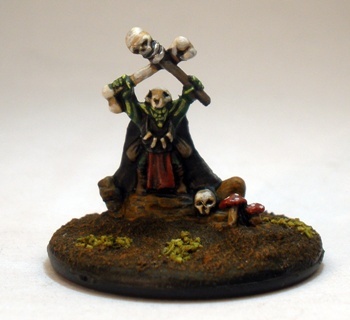 Speaking of uninspiring, the shaman model (also plastic and from the Five Armies box) is is the opposite I reckon: he is a cool looking little guy who stands out on the tabletop, partly because of his round base but also because of his cloak and skull topped, shamanistic accoutrements. 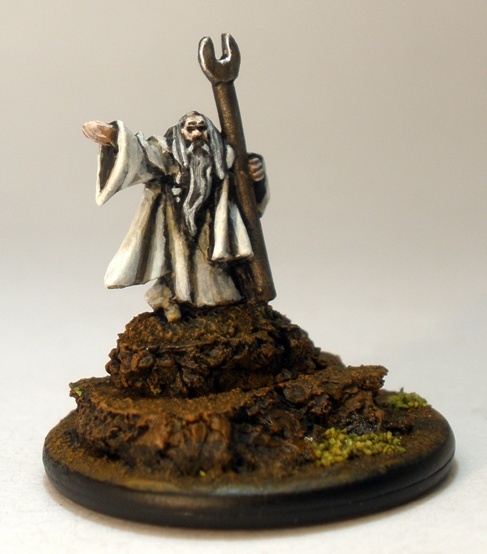 Painting this malignant little turd was my reward for painting the rank and file. I enjoyed painting the figure and I think that it shows. I still havent named him (or any of his colleagues) yet though. Like getting some half decent photos of the army as it grows, all in good time. Next up will likely be either be my first unit of trolls or my first unit of orcs, I havent decided which yet.